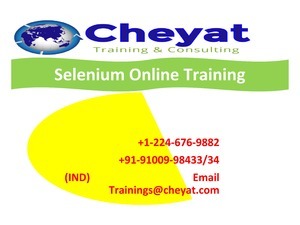 Cheyat can help you to become incredibly competent in Selenium. With many years of experience in online training and with best-in-industry trainers we provide the most advanced and up-to-date Selenium online training. Join us to make know the difference we can make to your careers. Our continuous and round the clock online support provides you an opportunity to clarify any doubts about Selenium Automation you may have throughout and also after completion of the course.